There are many places where dogs are not permitted and it is important to make sure that those who own and walk dogs are aware of the limitations. 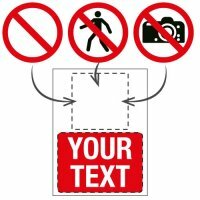 It may be that you need signs for a shop or for a public place, for example a specific area of a park. We have available a variety of signs available with differing legends and, with the range of signage fixings on offer, they can be put up almost anywhere, indoors or out. Some shops and workplaces only allow you to take a dog in with you if it is a guide dog or assistance dog. The sign to indicate this is a simple ‘No dogs except guide dogs’ message with the easily recognisable image of a dog in a circle with a line through it. The message is clear and these signs can be placed at doorways and other entrances. For glass doors then window fix signs are ideal. These are made from vinyl and are supplied with either a removable self-adhesive backing or a permanent self-adhesive face. Other materials available include self-adhesive vinyl, adhesive rigid plastic and rigid plastic, all of which are suitable for use both indoors and outdoors. See our guide to signs materials for more information on each material. The same ISO symbol is used on all dog prohibition signs to ensure that everyone knows and understands that dogs are not allowed, or that there may be some exceptions – for example, no dogs except assistance dogs. Another option is a sign with more of an explanation. For example, a sign that states that dogs should not be walked in the area for reasons of health and hygiene. This sign will effectively prohibit dogs from being taken into a certain area where their presence could be a risk to other people's health. Specific wording is available on other dog related prohibition safety signs making it clear, for example, that dogs are not allowed into a playground area. These signs are ideal for a public park where dogs may be permitted in other areas but in the interests of health and safety, particularly that of children, dogs are prohibited from entering a children’s play area. For more prohibition signs check out our whole range. If you are looking for a no dog sign that is more specialised to you and your business, then we can create a sign to your specifications. Simply choose the size and material required and add your message – it couldn’t be simpler. There are plenty of places where dogs are permitted or certain behaviour must be observed. This is where the right signage comes in to make it clear that dogs are welcome, providing they are properly supervised, of course. For example, if dog fouling is a problem or you simply want to let owners know that dogs are allowed if they are on a lead, then we have available a large range of other dog-related signs. These may remind owners to clean up after their pet or to ensure their dog is kept on a lead.